Literary Reading Review: McSweeney’s Variety Show featuring Boots Riley, Oct. 17, Z Space; “We Are Mystic Detectives About To Make An Arrest” hosted by D. Scot Miller, Oct. 18, Aldea Home. According to the most recent U.S. Census figures, SF’s black population is just a shade under 4 percent, and in danger of further erasure from the tech boom. That’s one of the reasons why, while the literary festival Litquake is a cultural phenomenon, it’s not a particularly diverse one. For instance, the banner display on the official Litquake site advertising October 18’s Litcrawl suggests a fun, hip social gathering — attended by not a single person of color. 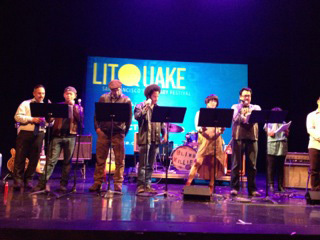 So when Oakland’s African American writers do a reverse Ralph Ellison and become visible during Litquake’s mega extravaganza of literary readings, shenanigans, tomfoolery, and uber-nerd geek worship, it’s kind of a big deal. That’s because black voices rarely occupy the cultural or intellectual space associated with hipsterish literary events, so when you do see and hear them, there’s a kind of ironic amazement at how naturally and genuinely they fit into those spaces, when given a chance. The night before the Litcrawl, Coup frontman Boots Riley was the highlight of McSweeney’s Variety Show, a sold-out event held at Z Space in Potrero Hill—once the childhood home of OJ Simpson, and now a sprawling neighborhood of industrial chic design aesthetics, tech companies, media companies, cute restaurants, cafes, and bars. 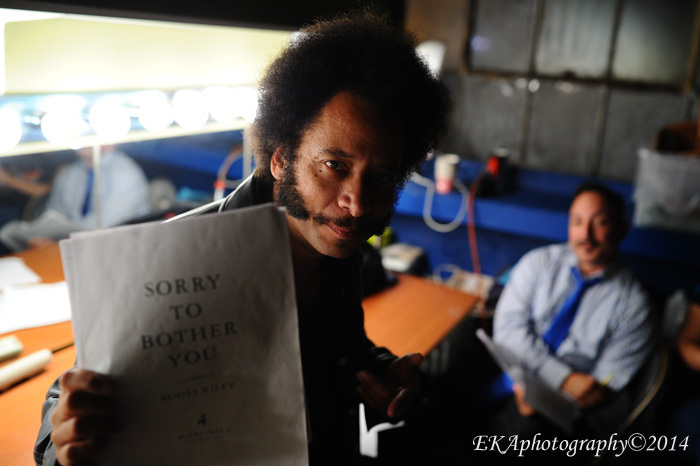 Riley was directing a reading of “Sorry to Bother You,” a screenplay inspired by his time manning the phones as a telemarketer at Stephen Dunn and Associates (full disclosure: I, too, worked at that firm in the mid-90s, at the same time Riley was there). I arrived about an hour before showtime, intending just to watch the proceedings and take notes. But when I showed up, and tried to get my guest list hookup certified, I was told I would be reading. It seemed that there was a part which could only be played by a black man, and none of the professional actors Riley had assembled were of ebon—okay, mocha-caramel—hue. So instead of watching from the audience, I was directed to the stage, where Riley and cast were doing a last-minute read-through of the script. My part was that of Langston, described as an “older black man” working at the telemarketing firm who tells the protagonist Cassius, played by Riley, the secret to becoming a “Power Caller”: use your white voice. The correct white voice, Langston explains to Cassius, isn’t the acceptable buppie patois of Will Smith, but the all-the-way Eurocentric vocal inflections of Al Roker. Anyway, we’re getting slightly ahead of ourselves here. 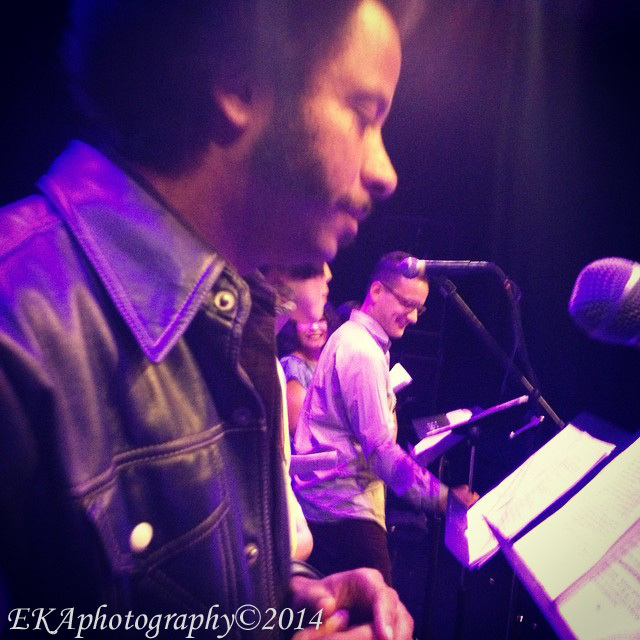 Reading “Sorry To Bother You” at Litquake. photo by Anya De Marie. It was a revelation, to say the least, to realize that Riley’s talents extend past his musical gifts. It’s one thing to write rap lyrics, and quite another to write screenplays. “Sorry To Bother You”’s storyline involves Cassius applying for work at the telemarketing firm, hanging out with his girlfriend Detroit, making an ill-fated trip to a VIP room at a local bar, attending telemarketing employee meetings, and being recruited by a guy trying to unionize the employees. What makes the screenplay work, however, is Riley’s keen sense of irony and knack for clever dialogue, which balances comedic witticisms with serious social commentary and class analysis. His is a sharply-honed voice that’s big on punchlines—a benefit to being a professional rapper—which makes the interplay between the characters fluid and lively. The Z Space reading covered just an excerpt of Riley’s screenplay (a full version will be published in an upcoming issue of McSweeney’s quarterly). According to Riley, the story gets more and more surreal and darkly comic, involving Occupy Oakland-esque protests and a corporation which hires employees for lifetime contracts. Riley hopes to get it made into a movie; if that does happen, it’s probably safe to say it won’t be directed by Steve McQueen or Tyler Perry. The next night saw “We Are Mystic Detectives About to Make An Arrest,” an Afro-Surrealist reading during Litcrawl, hosted by D.Scot Miller, author of the “Afrosurrealist Manifesto.” In his manifesto, Miller explains that Afro-Surrealism isn’t like the European Surrealism of Dada or Dali, and it’s not the African Surrealism of Leopold Senghor’s negritude movement, either. Nor should it be confused with Afro-futurism, which focuses on science, technology and a timeline which hasn’t yet happened. Some may see the origins of Afro-Surrealism in the novels of Chester Himes, but as Miller pointed out Saturday night, the term was actually coined by the late Amiri Baraka, and counts Ishmael Reed (who coined the phrase which served as the reading’s title) as among its influences. In addition to Miller, the lineup included my good friend Malcolm Shabazz Hoover, Ayize Jama-Everett, Michael Warr, and Mike Sabb. All were brilliant, whether reading short stories or poems, all of which spoke to the black experience as it’s happening now. The event attracted a standing-room-only crowd which filled every corner of Aldea Home, an uber-upscale home furnishing store—call it Bed, Bling and Beyond—where, for a $10,000 purchase, Design Consultants are available to help rich hipsters fulfill their aesthetic needs, while the less-monied resort to one-star Yelp reviews to vent about poor customer service and alleged racial discrimination. Anyway, the ironic surrealism of an Afro-Surrealist reading on Valencia St., the symbolic center of post-gentrification SF, a city whose African American population has steadily been siphoned away to next-to-nothingness, wasn’t lost on Miller. He joked that the event might have temporarily raised the city’s black demographic numbers by a percentage point or two, which is either a) not funny; or b) funny but sad, depending entirely on your perspective. 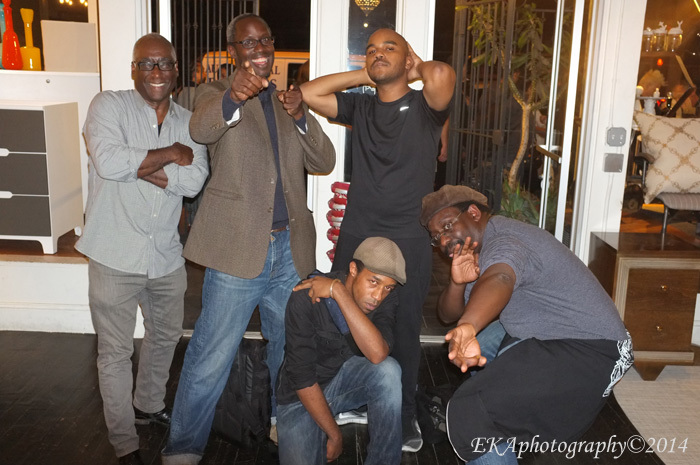 It’s also ironic that it took a cadre of Oakland folks to bring blackness to Litquake. Taken together, the two readings showed that there’s plenty of life left in the Black Arts movement, and that Oakland has to be considered a fertile incubator for the contemporary version of that movement. While Riley and Miller’s readings added something Litquake was otherwise missing, they represent just the tip of the iceberg: there’s much more (mostly unheralded) literary talent in the Town, just waiting to be discovered. 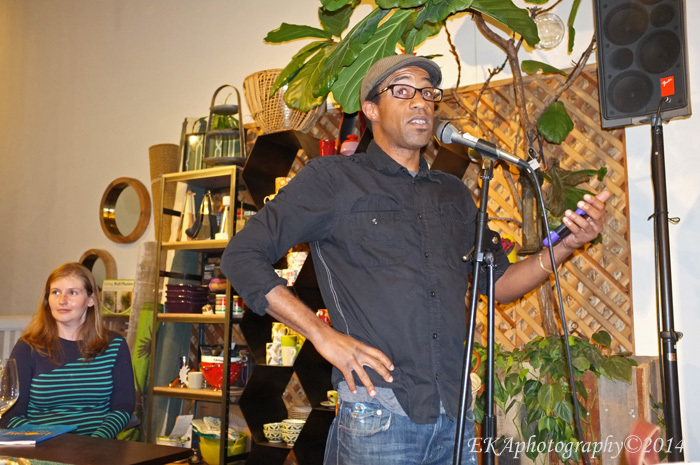 So while Litquake generated more interest in the Afro-Surrealist movement, one hopes its aftershocks will continue to reverberate and shine more light on Oakland’s black authors. Categories: Literary Review | Tags: Afro-Surrealist, Amiri Baraka, Boots Riley, Chester Himes, D. Scot Miller, Ishmael Reed, Leopold Senghor, LitCrawl, Litquake, McSweeney's, Sorry To Bother You, Valencia St. | Permalink.